“Is it true there is a moss that only grows on the carcasses of dead sheep?” Indeed, yes. The Splachnaceae (dung mosses) specialise in decaying animal matter. 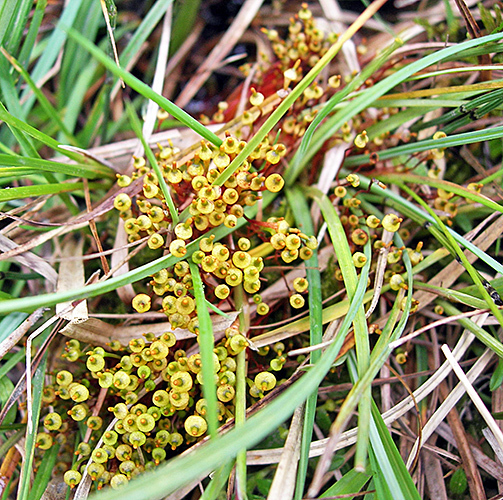 Unlike most mosses, whose spores are spread by water or wind, this group of mosses produce sticky spores that are dispersed by flies attracted by the decaying substrate. To improve its reproductive opportunities, the moss produces volatile octane derivatives (aromatic compounds) that it releases through enlarged stomata in the modified neck of the colourful capsule. Enlarged stomata in neck of Splachnum spp. The sticky spores tend to travel in clumps, so not only are the flies likely to deliver them to another suitable habitat, but both sexes of the dioecious plant probably travel together and so can grow adjacent to each other on the new patch of dung. In dry conditions, the capsule contracts, squeezing out the spores when insects are likely to be about. In wet weather, the capsule relaxes, keeping the spores inside until insects fly again. 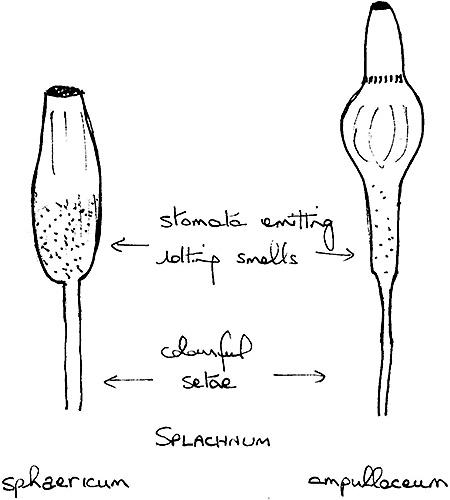 The example in the illustration is Splachnum ampullaceum or cruet collar-moss, the only one I’ve seen so far. A gaudy growth of bright red setae topped with bright orange-yellow containers with a large bulge in the middle caught my eye on a Yorkshire moor. They looked almost like something from a party shop in their vivid colours and distinctive shape, numerous capsules standing about 4 cm tall above a cowpat. This is the commonest moss of this unusual genus in the UK, growing only on decaying animal excrement. Under the microscope, its leaf has coarsely toothed margins and very large cells (about 120 × 30 μm). Other plants in the family include Splachnum sphaericum (pinkstink dung moss) and Tetraplodon mnioides (slender cruet moss). In these, the leaf margin is untoothed and the capsules are much more of a normal cylinder. Splachnum sphaericum grows in wet pasture generally above 360 m altitude and most often where sheep droppings have been trampled into the ground. Tetraplodon mnioides is the coloniser of dead sheep. According to my books, its tufts are limited in size, on bone in late stages of decay. It has stout dark red setae and purplish black capsules whose massed effect is also said to be very striking. Because of their preferred substrate and short-lived lifestyle, these are not mosses that can be found to order, but by lucky chance.